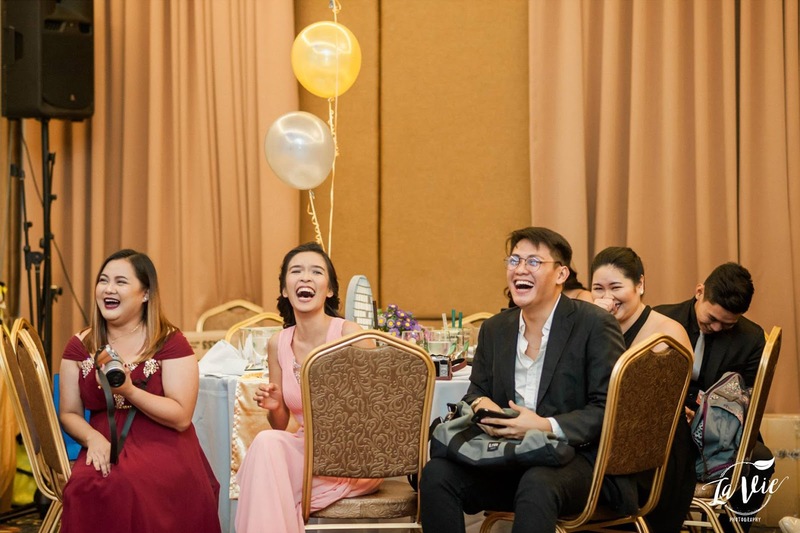 A Grand Christmas Ball to Remember - Life is so full of tae! "Hey, I got a new badge on my blog." "Thanks! But I want to add something right there." "I want to win a Palanca," I told Jan flat out loud. He gave me an eager look as he continued to listen to me and my absurd dreams. I rolled my eyes, gave out a soft sigh, and blurted, "I just do not know how to do it." You see, I've read this year's winning entries - mostly from established writers, journalist, and columnists - and I certainly do not make the cut. 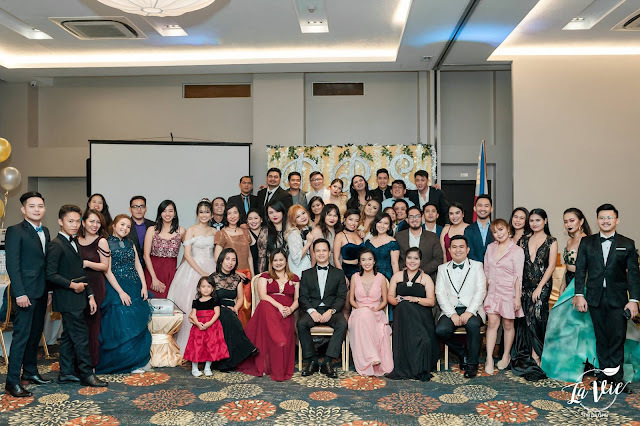 The Davao Bloggers Society (DBS), in partnership with Smart and ASUS Zenfone, held its annual Christmas party. 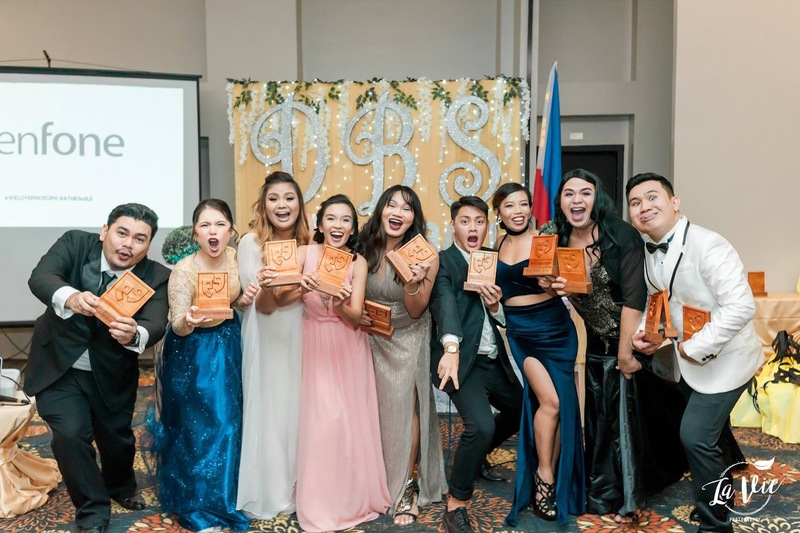 Co-sponsored by Ardent Communications, the event also highlighted the most awaited Davao Blog Awards 2017. 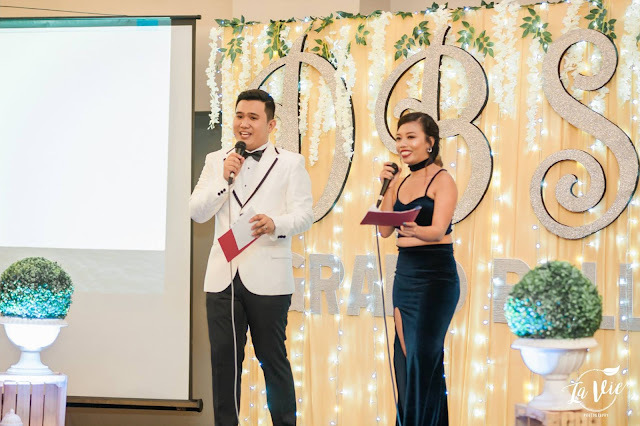 As an officer, I was one of those who organized this party - the most glamorous party DBS has ever had. To tell you honestly, IT WASN'T EASY. But I am glad to say we were able to pull it off. I take pride in the dedication and effort the officers and volunteers have put in. Hence, I'm sharing with you snippets of that night. The night we'll always remember. December 2, 2017, Saturday, I came a little earlier and was delighted to see beautiful faces the moment I stepped out of the elevator of the hotel. 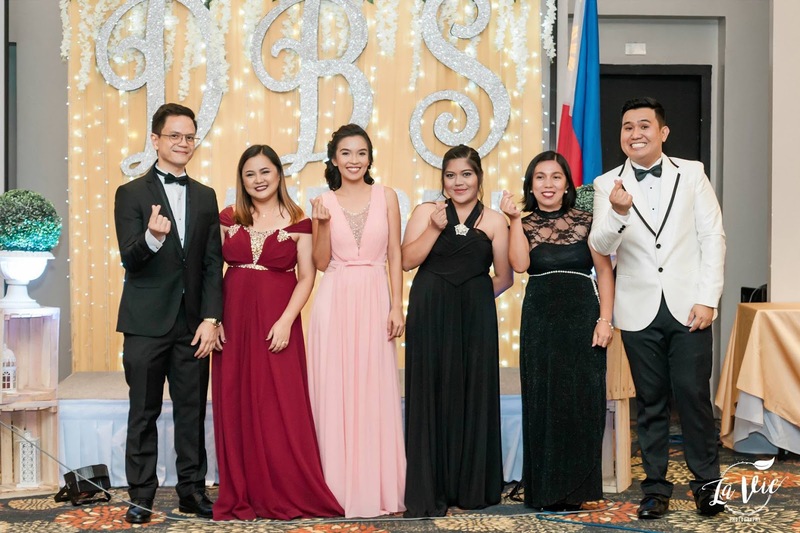 Gone were the usual OOTDs and were replaced with tuxedos and gowns. 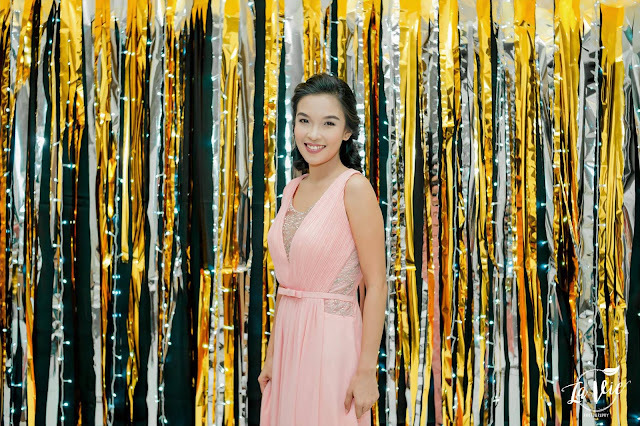 I immediately noticed the pretty photo wall and decided to have my photo taken by the event's official photographer, La Vie Photography. After a few poses, I strutted my way inside while sipping InfiniTEA's milk tea that welcomed us at the entrance, not minding if I smudge my lipstick because I can just apply the new lip tint I got from Kiss & Tell Cosmetics. I placed my things on one of the tables donned in white and gold. I looked around and was pretty impressed. It was so beautiful. The set-up, the lights, the backdrop have added elegance to everything. Just like any other blogger, I took photos and mingled with others. I joined my fellow officers afterwards and was truly overwhelmed as we set up the gifts from our generous sponsors namely, Añejo Gold Medium Rum, Megaworld, McDonald's, The Herschel Supply Co. Brand, PLDT Home, My Skin Origins, Starbucks, Macho Mucho, 8Telcom, and Pino Tropika. Then we went on with the usual program. You know, singing the national anthem, prayer, opening remarks from the President, welcoming guests, games, and more. I never really enjoyed formal events because, well, they're too formal, refined, and serious - words you can never associate with me. But our hosts for the night loosened things up and made sure there was never a dull moment. And there never was. The pictures don't lie. The fun didn't stop there. As the DJ did its magic - mixing the tracks to set the mood - we took part in raffle draws and enjoyed more surprises from SM Supermalls, Tekpone, A. Refinery, Chimes Boutiques, Native Shoes, Flossy Footwear, KJM All Natural Cosmetics, Tipasi Organic Spa, Cacai Brush by Hairfood Co., Tori Yamu, and Renz Bulseco. Of course, any party wouldn't be complete without the food. 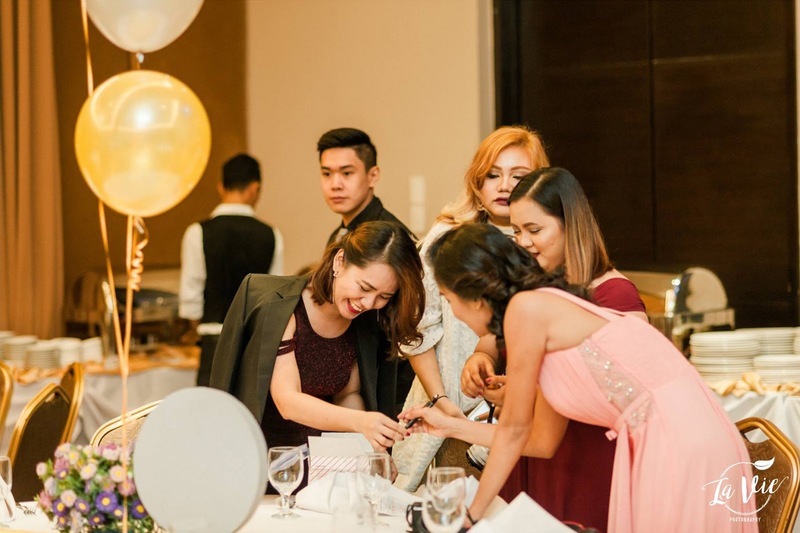 So we helped ourselves to the delicious buffet and stuffed our tummies with scrumptious desserts provided by Real Confections and Milky Cakes and Sweets. 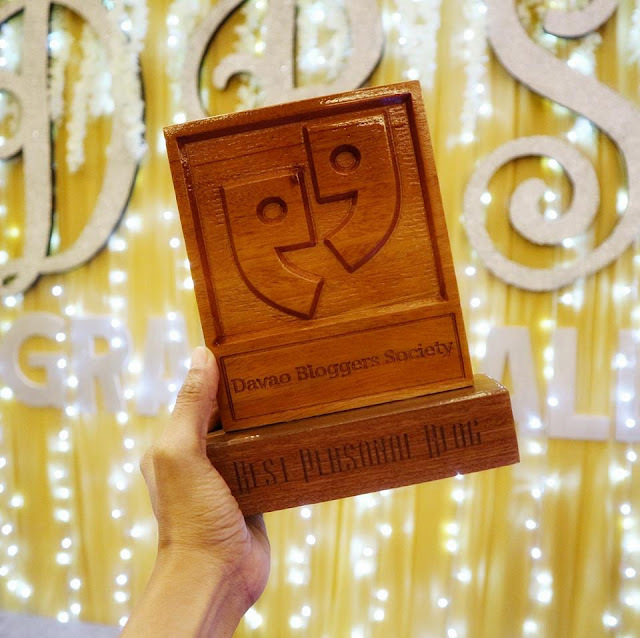 The evening continued as the winners for the Davao Blog Awards were announced. 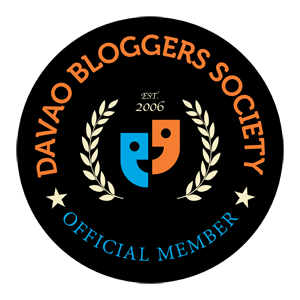 Davao Blog Awards happens yearly and it aims to recognize and award the outstanding works of its members in their respective niches. However, this year is entirely different. DBS officers are no longer exempted to be short-listed and win. So now, there are more finalists which could only mean a tighter competition and a slimmer chance of winning. An awards committee was created to ensure a fair and square competition. So, we really do not have any idea what's going on, not the slightest bit. 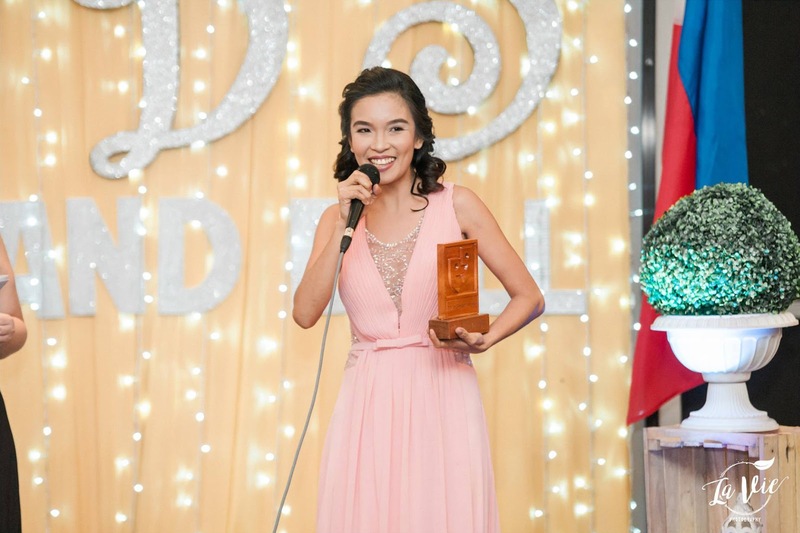 I would have loved to share every bit of detail about how the awarding went but I'm afraid I don't have the time. So I'll just make the story short. My jaw dropped to the floor when I heard my name and saw my photo come up on the screen. I know how much I wanted to get my hands on this beautiful trophy crafted by House of Wooden Letters but I never really thought I'd take it home. I was totally surprised because every finalist deserves to win. I'm not even sure if I uttered the right words when I made that acceptance speech. But I know and I am certain that my heart was overflowing with gratitude. We ended the night with a bang. Everyone left not just with gifts but with something to look forward to. It has been a great blogging year and I know for sure the incoming years will be better. I would have loved to say that I got intoxicated from partying, but I'm sorry to disappoint you there, buddy. I went home that night with an almost unnoticeable pain in my jaw. I think I got that from laughing and smiling too much. It's definitely a night I will always remember. I sat down and examined my trophy as I let my fingers skim across the carefully carved words: Best Personal Blog. I put the trophy down, shook my head and smiled. I remembered those times when I agonized over an empty document, while I allowed the blinking cursor to mock me for the lack of creativity. I would even beg for the words to come. Or those times when I had second thoughts in publishing a post because it was too personal or opinionated and people may hate me for it. Or those times when I went on a blogging hiatus and thought of quitting because I wasn't good enough. Whoever said that blogging is easy, is absolutely lying. Writing itself is difficult and that is just a scratch on the surface. 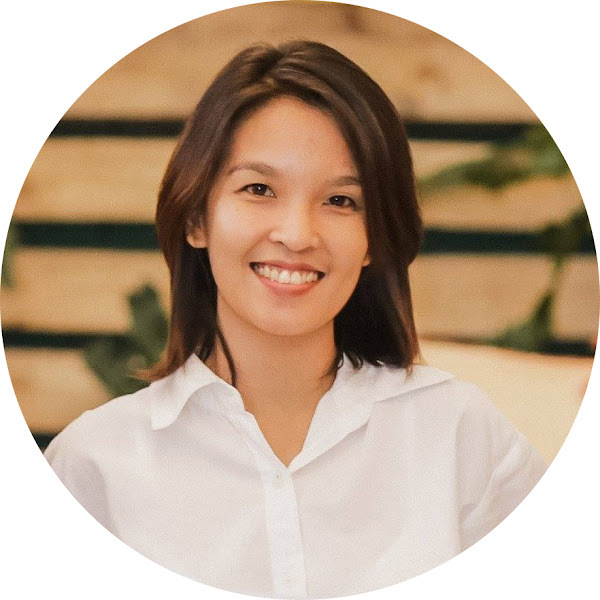 It takes passion, commitment, courage to face those insurmountable backlogs, chronic sleep deprivation, and perhaps a few emotional breakdowns to come this far. And with that, I would certainly say, we are all winners in this. I hope you will not think that I'm trying to over dramatize a Christmas party. It's just that, of all the parties I've attended and awards I have received, this is the most stirring. I realized there's more to a grand ball and an awards night than meets the eye. It's not the dashing tuxedos and lovely gowns, nor the elegantly decorated halls that made this ball grand. 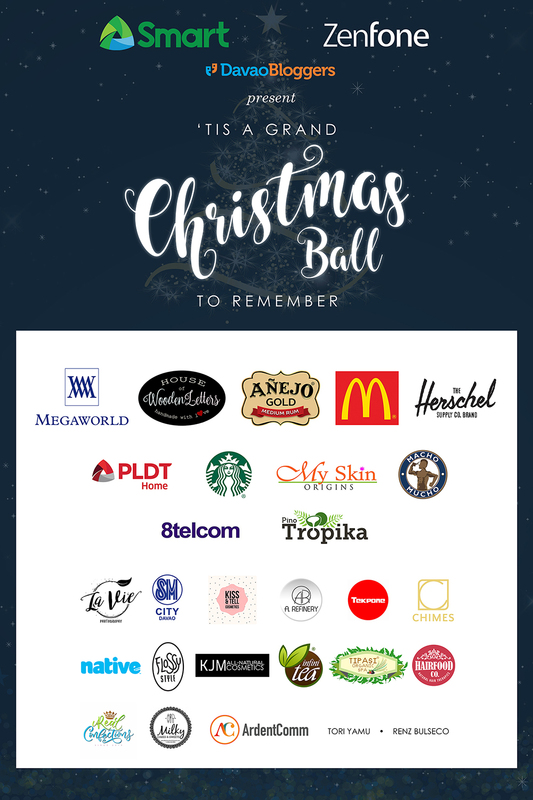 I believe it would still be a grand Christmas ball worth remembering even if we celebrated this in our jeans and shirts. Because nothing is grander than being with a company who treats you like family, the generosity of our valued sponsors who were once total strangers but believed and supported us all throughout, the inspiration that we draw from one another, and of course, the motivation we get from our dear readers who have stuck around that kept us going, inching us a little closer to our dreams no matter how absurd and impossible they seem to be. I know this event pales in comparison to those prestigious national gala awards nights, but I would not have it any other way. I will forever be proud and grateful because this will be a reminder of my humble beginnings and how it is helping me move closer to my Palanca dream. 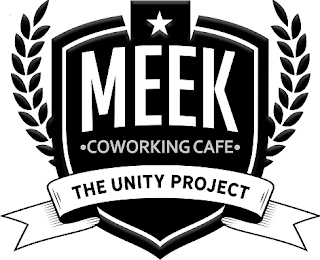 One blog at a time. You're so pretty! Congratulations! Well-deserved win. 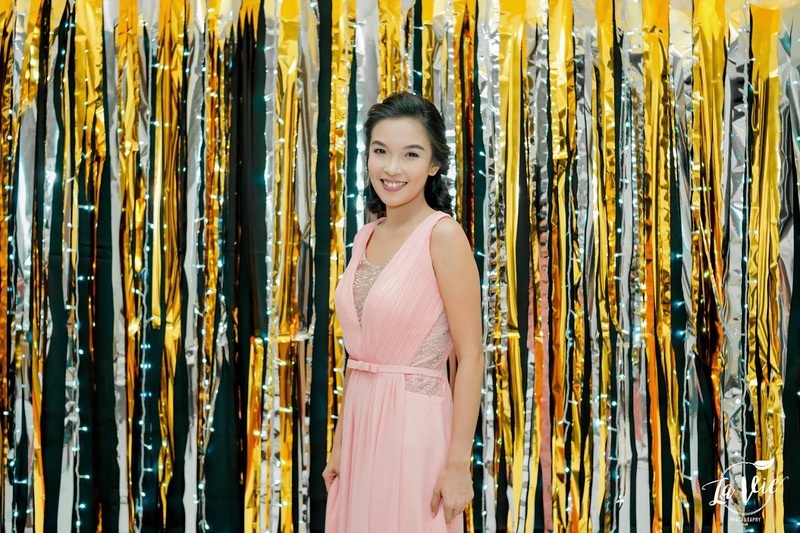 You looked gorgeous! It looks like you had a great time. It’s great to go from normal clothing to getting all dolled up sometime. Congrats on the award and thanks for sharing! What a magic night! 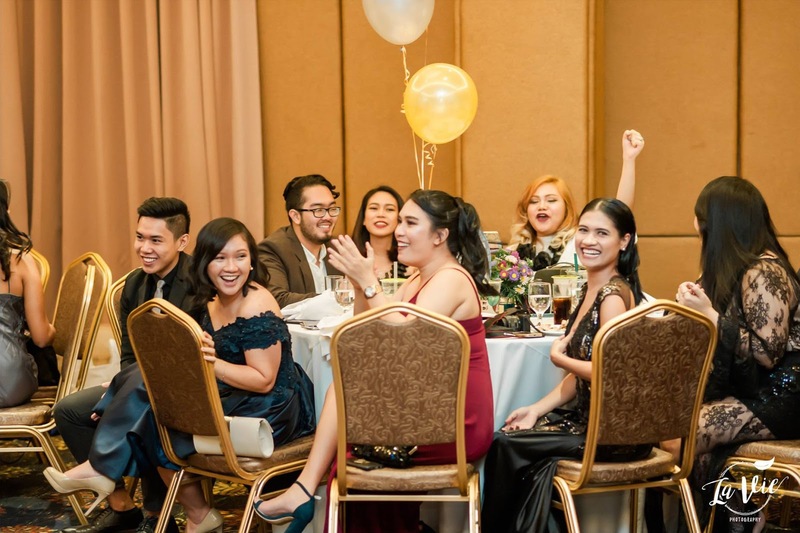 Everyone looks so polished in their ballroom clothes. Congrats on being surprised and winning an award. As you wrote, blogging is not so easy, it is really a lot of hard work. congratulation on your award darling . you deserve it plenty ! looks like a magic evening and you look dashing ! Oh wow! Congratulations girl! You look gorgeous, this looks like a fun event and the trophy was totally well-deserved! This must be one of your best Christmas gifts, right?